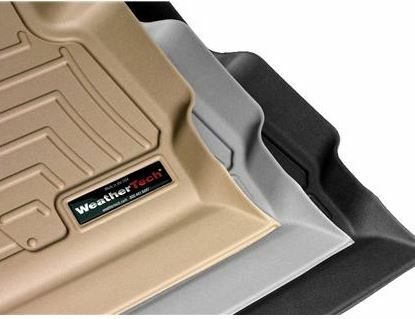 Keep your vehicles floor clean from debris with All-Weather Floor Mats from WeatherTech. 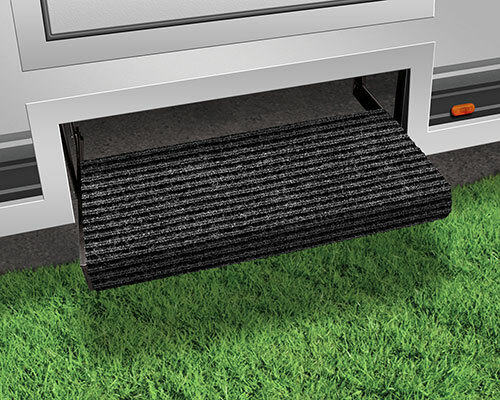 These All-Weather Floor Mats were designed to give the best possible protection for your vehicle floor and are made to stay in one place! They will not curl, crack or harden in sub-zero weather. If you do happen to make a mess, cleanup is a breeze due to the protective, non-stick finish! The Rhino Blaster Pro Tank Rinser latches securely onto your RVs sewer outlet. The 45-degree angle allows water to blast directly into the outlet, rinsing out residue. Blaster Pro Tank Rinser features a clear elbow to see when the water runs clear. A gate valve prevents waste from flowing through the hose until done rinsing the tank, and the vacuum breaker prevents backflow into the water hose. Additional features include a four-prong bayonet swivel fitting that easily and securely attaches to the RV’s sewer outlet, and a swivel lug fitting to connect to your sewer hose. For more information, please call the Lichtsinn RV Parts Department at 1-800-343-6255 or email parts@lichtsinn.com. 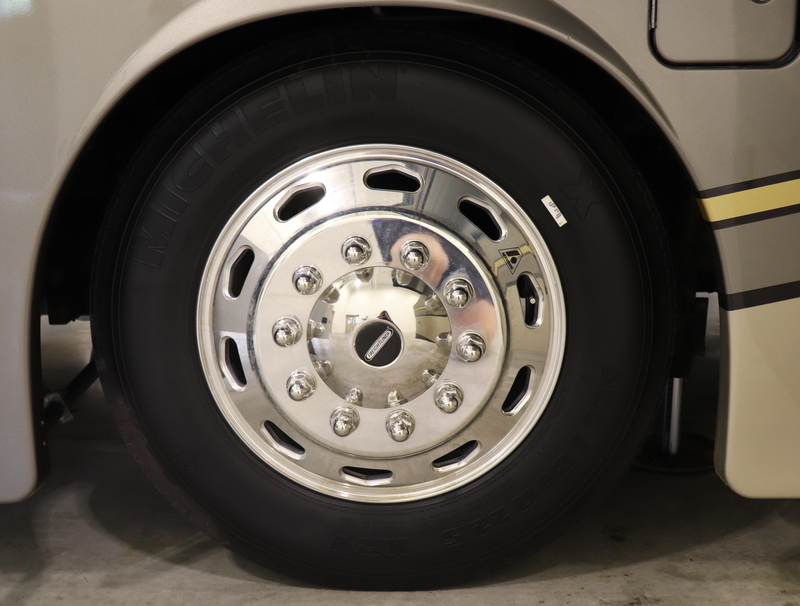 In a recent webcast, Ron Lichtsinn covered a few options to extend the life of your RV tires including MULTI SEAL, Nitrogen, and Tire Pressure Monitoring Systems. You can watch a video of the webcast here. MULTI SEAL – Extend tire life and protect the people and equipment that are riding on them. Originally designed specifically for the US and UK military, since 1981 MULTI SEAL has manufactured high performance tire sealants, scientifically formulated to virtually eliminate air loss due to punctures and slow leaks. Using proprietary formulas and ingredients, MULTI SEAL products are blended in the United States specifically for industrial segments. MULTI SEAL is the world leader for superior tire sealant technology. The name of the game is prevention. MULTI SEAL’s 21st century formula works inside your tires filling holes and punctures instantly. Fewer leaks mean fewer flats and longer lasting tires. The result is less money spent on new tires, retreads and damaged wheels — and eliminating down-time during vacation. Prevention also means keeping all tires properly inflated to avoid lower performance and decreased tire life. MULTI SEAL tire sealants combined with a regular tire maintenance program can result in a dramatic economic savings. NITROGEN – There are many reasons to make the switch from regular air to nitrogen. Tires filled with nitrogen maintain consistent tire pressure which saves drivers money by increasing gas mileage and extending the life of their tires. Using nitrogen in your tires, is a great way to save money and help the environment at the same time. In fact, many environmental groups are encouraging the use of nitrogen in tires in order to improve gas mileage and reduce the number of rubber tires that need to be replaced through wear and tear on the road. Proper inflation is the key to improving gas mileage and nitrogen doesn’t lose pressure as temperatures rise and fall. Motorists can improve gas mileage by 4-10 percent simply by keeping their tires properly inflated. Nitrogen molecules are bigger than oxygen molecules, so nitrogen seeps out more slowly from tires than air; nitrogen resists heat buildup better than air, which contains moisture; and nitrogen reduces oxidation, which can damage the tire from the inside out, proponents say. Nitrogen is an inert gas, so there are no safety or environmental issues. TIRE PRESSURE MONITORING SYSTEM – A Tire Pressure Monitoring System (TPMS) is a device that monitors tire pressure and alerts you if a tire issue occurs. Your tires are an important part of your RV, you can not only ruin a trip with an unexpected tire blowout, you will also be looking at spending a great deal of money. A TPMS provides alerts for tire issues. The main cause for a blow-out is under or over-inflated tires. A tire pressure monitoring system will allow it’s user to be warned of such conditions, helping them to avoid a blow-out. TPMS that provide temperature warnings can also provide an early warning of issues such as locked brakes. TireMinder is the #1 Tire Pressure Monitoring System in North America. TireMinder is a great TPMS solution for your RV, MotorHome, 5TH Wheel, Motor Coach, Trailer, and more. With its easy to program interface and fantastic customer support, it’s no wonder why Motor Home & Trailer Life magazines reader’s voted TireMinder #1 for Tire Pressure Monitoring Systems 3 years in a row. You can purchase the TireMinder Tire Pressure Monitoring System from the Lichtsinn RV parts department by calling 1-800-343-6255, emailing parts@lichtsinn.com or visiting https://www.lichtsinn.com/rv-parts. The Winegard ConnecT 2.0 creates an RV hotspot and maximizes speed, reliability and range from both WiFi and 4G LTE networks, ensuring customers can stay connected to their smartphones, laptops, media players and other devices. The ConnecT 2.0 models are simple and quick to setup with step-by-step onscreen instruction to connect to all your devices in just seconds. Security is a top priority, and customers only need to setup their secure network once for peace of mind. The products offer Advanced WiFi protected access, a separate guest network access option, and double firewall protection. The Connect 2.0 family of products comes in a sleek, low-profile dome. The ConnecT 2.0 is a convenient aftermarket accessory, available from Lichtsinn RV’s Parts Department. We offer complete installations of dinghy setups, including Blue Ox products. Setup takes about a full day and we offer package pricing on complete setups. Leave it to the experts on this task to keep you secure down the road! Dinghy towing or towing your vehicle behind your motorcoach with all four wheels on the ground is by far the safest and most convenient way to bring your passenger car, truck or SUV. Although no manufacturer has yet to engineer a plug-and-play setup directly from the factory, it’s never been simpler to equip both dinghy and motorhome for road usage. Lichtsinn RV’s parts department sells Blue Ox’s family of products for sale including the Ascent and the Avail tow bars. WATCH OUR VIDEO ON THE BLUE OX FAMILY OF PRODUCTS HERE. If you are interested in learning more about Blue Ox’s family of products and if they will work with your RV please contact the Lichtsinn RV Parts Department by calling 800-343-6255 or email parts@lichtsinn.com. You can learn even more about towing with your RV by clicking here. The Camco RV Water Heater Drain Plug Kit is specifically designed for use with RV water heater drain plugs. The angled design conveniently fits in tight spaces and includes prongs for rusted drain valves. 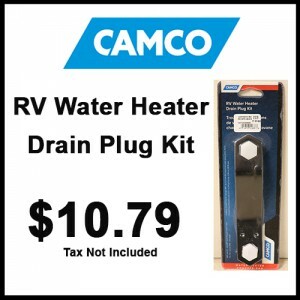 Watch this video to learn more about the Camco RV Water Heater Drain Plug Kit. You are wrapping up another fun-filled RV trip and you are ready to pull out of your campsite. All of a sudden, you look down and realize your tire pressure needs some attention. 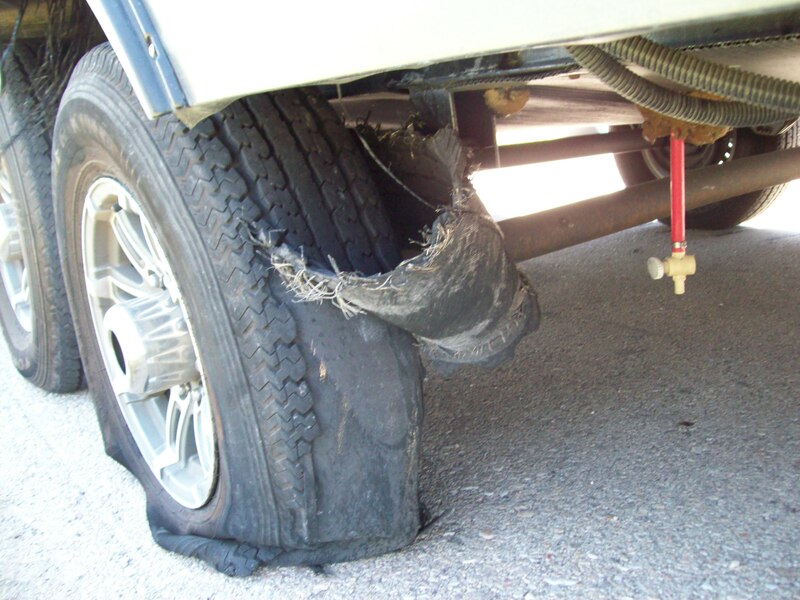 It is time to change the tire on your RV… are you prepared? Take a breath, relax and follow our easy step-by-step tutorial to change your RV tire. Camper tires or trailer tires aren’t much different from the tires on a normal car or truck, although they may be much larger depending on the size of your motorhome or RV. Luckily, that means changing a tire on an RV follows generally the same process. Before changing your tire, you’ll want to assemble all of the necessary tools and equipment so they’re ready to go. First, you’ll need two RV jacks or an RV leveler. This will raise the height of your motorhome or camper so you can access the trailer rims and tires. You’ll also need a lug wrench or tire wrench, as well as a spare tire to replace the flat one. Finally, it’s time to do the repairs. Before starting, make sure to move your RV to a safe place where you’re not in danger of being hit by other cars. 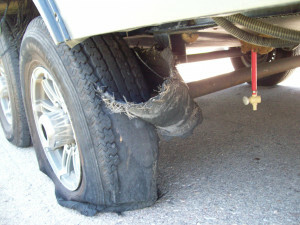 Using the RV jacks or RV leveler, raise the vehicle just high enough so the trailer tires and wheels can spin freely. Next, take the tire wrench and remove the lug nuts. Pull off the bad tire and fit the spare tire into place. Using the wrench, replace and tighten the lug nuts. That’s it! Now that you’ve successfully changed a tire, it will only become easier each time in the future. You might even become that person at the campground who others call on for help when they’ve got a flat tire themselves. The next time you are at Lichtsinn RV, ask your service or sales consultant about our Multi Seal Tire Sealant. Multi Seal Tire Sealant extends tire life and protects the people and equipment that are riding on them. Since 1981, Multi Seal has manufactured high performance tire sealants, scientifically formulated to virtually eliminate air loss due to punctures and slow leaks. Multi Seal‘s 21st century formula works inside your tires filling holes and punctures instantly. Fewer leaks mean fewer flats and longer lasting tires. The result is less money spent on new tires, retreads and damaged wheels — and eliminating down-time during vacation. Learn more about Multi Seal here.